Rinse turkey and remove giblets. 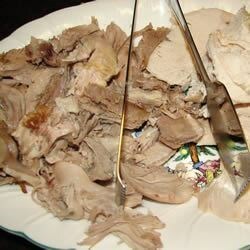 Place turkey upside (breast) down in a roasting pan. Insert 1/4 cup butter inside the turkey. Place remaining butter in several pieces around the turkey. Pour water into the pan. Cook covered in the preheated oven 3 to 3 1/2 hours until the internal temperature of the thigh has reached 180 degrees F (80 degrees C). Cooking the turkey upside down does help keep the meat moist. I like to use a cooking bag too because it cooks faster and seems to retain more juice. This was super. The only thing I changed was to cook in a cooking bag, salt & pepper inside and outside of turkey and stuff butter in between skin and meat.